Elevated between 2822 ft and 7546 ft, the Ski Resort is among the 10 highest elevated Ski Resorts in Salzburg. The vertical drop from summit to base is 4724 ft. The average difference in altitude between base and summit of Ski Resorts in Austria is 2388 ft. Most runs are therefore relatively long. It is among the 5 most family-friendly ski Resorts in Salzburg. Season starts on Dec 1 and ends on Apr 22 (142 days). Average season duration in Austria is 114 days. Average snow depth during the season (Dec 1 to Apr 22) is 51 " at summit elevation and 13 " at base elevation. Snow coverage is usually best during February, offering an average snow depth of 68 " at summit elevation and 19 " at the base. 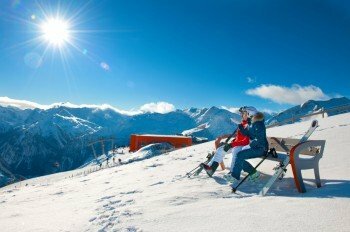 Therefore Bad Gastein - Bad Hofgastein is among the 5 ski Resorts with best snow conditions in Salzburg. Bad Gastein - Bad Hofgastein features 56 sunny days on average per season. The average for all ski Resorts in Austria is 63 sunny days. February is the sunniest month with an average of 20 sunny days. Offering 53 miles of slopes and terrain, Bad Gastein - Bad Hofgastein is among the 5 largest Ski Resorts in Salzburg. Implementation of the project "Schlossalm NEU" have started in summer 2017. The 84.4 million euro investment's core is the new gondola, set to start operating in December 2018. © Gasteiner Bergbahnen AG Skiing pleasure with a great view at Stubnerkogel. Interconnected as they are, Bad Gastein and Bad Hofgastein make up the largest connected ski resort at Gastein valley. The 86 kilometres (53 miles) of mostly blue and red slopes make for diverse piste pleasure on up to 2,300 metres (7,546 ft). 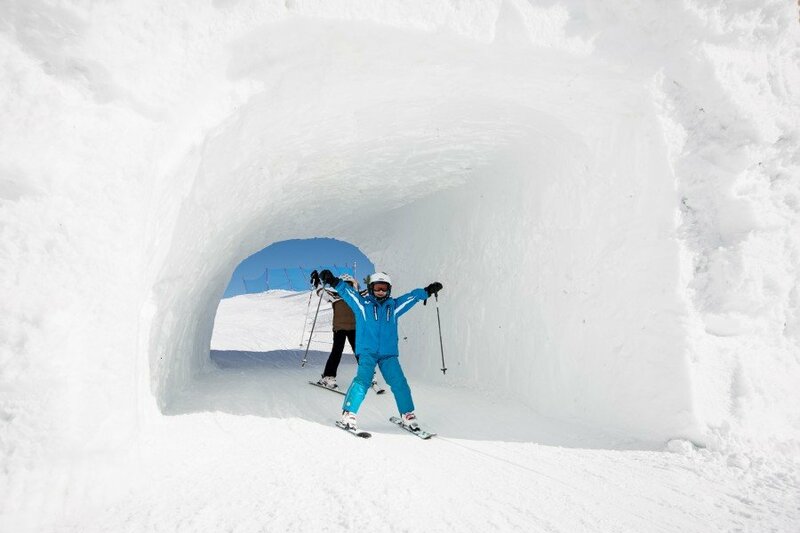 Beginners should find Gasti Schneepark, at Skizentrum Angertal near Bad Hofgastein. 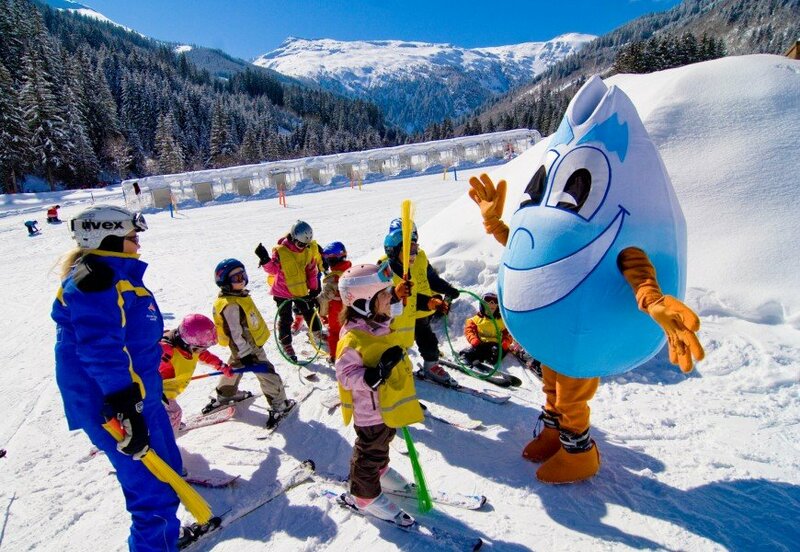 Along with mascot Gasti, the little ones discover the joy of winter sports. Furthermore, there are some playful elements like slides, a maze, a tubibing track, or a snowball target wall. The big snow igloo is the major highlight for many kids. Backcountry skiers start into the powder from Kaserebenbahn's top station. The route from Schlossalm to Anger valley starts here. 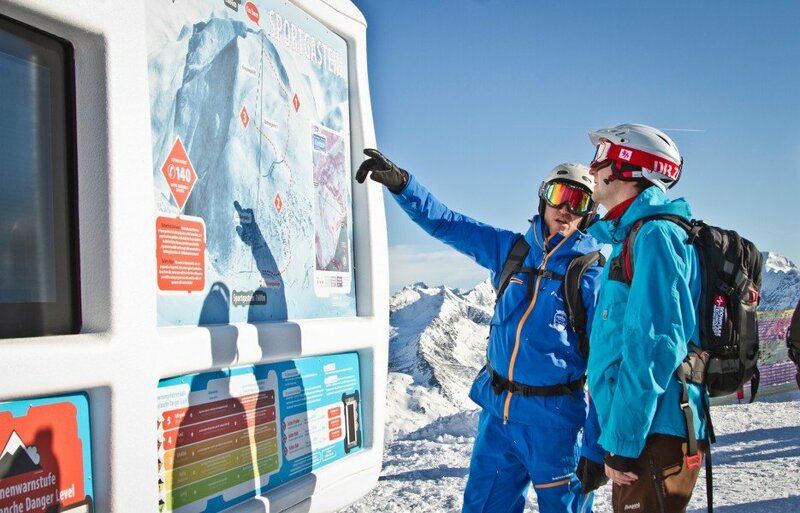 There is also an Info Base near the top station, providing skiers with relevant information about current snow and weather conditions. However, the absolute hot spot for powder freaks at Gastein valley is admittedly the neighbouring resort Sportgastein. 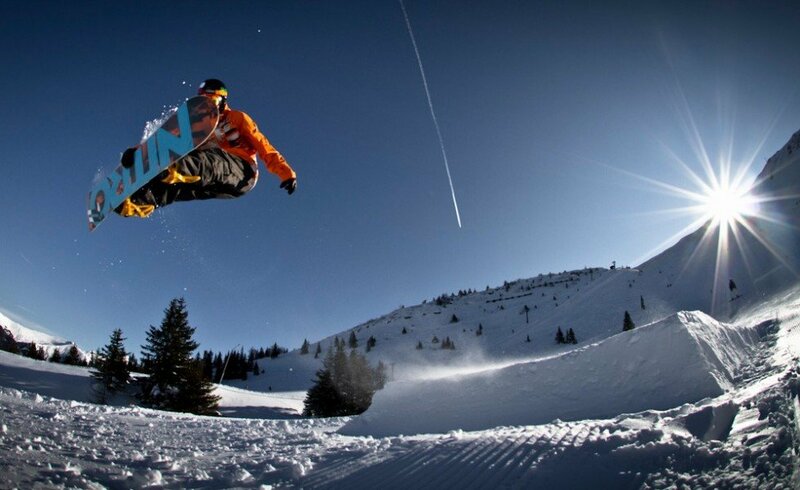 Snowpark Gastein is the place to be for freestylers. The diverse set up contains over 30 obstacles in three different areas for beginners, intermediates, and pros. Furthermore, the terrain park has its own tow lift. Before or after you've worked on your tricks, you can relax at the chill area. 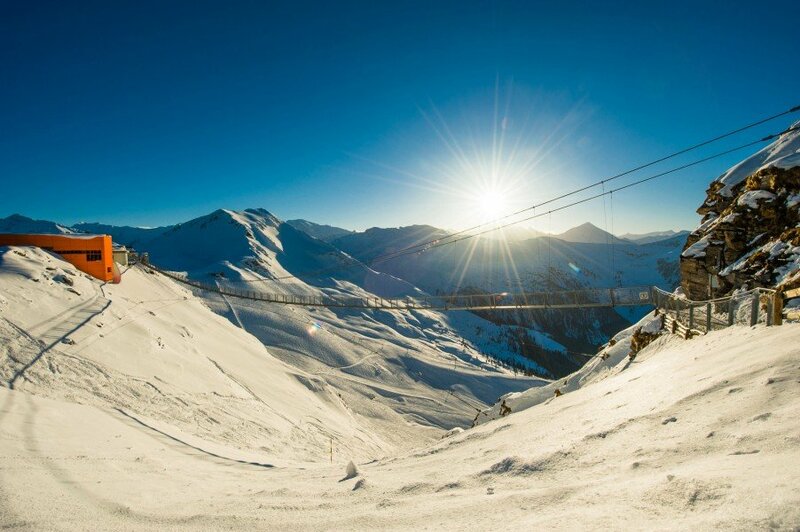 Funslope Gastein is a great way to give variety to your day on skis or snowboard. The course goes over boxes, small jumps and banked turns, and further elements. The 650 metre (3,133 ft) long trail's highilght is the 10-metre snail. The fun slope is serviced by two lifts, Sendleitenbahn, and quad chair Kleine Scharte. Experienced skiers find a challenge at Graukogel in Bad Gastein. Another 12 kilometres (7.5 miles) of slopes with especially long and partly difficult runs are located here, sheltered from the wind by its forest location. There are 2 chair lift and 1 tow lift, without a direct connection to the other areas. Reduced day tickets for Graukogel are availble. © Gasteiner Bergbahnen AG Gastein's dining facilities provide delicious food in a cosy atmosphere. Several on-mountain dining facilities make sure you don't have to ski on an empty stomach. At Skizentrum Angertal, you can recharge at Feldinghütte, Hirschenhütte, or Waldgasthof Angertal. 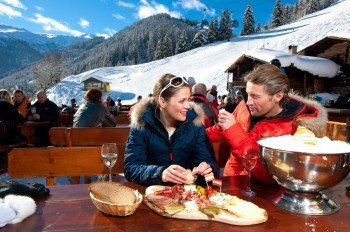 At Stubnerkogel, you have vour restaurants to explore: find regional cuisine at cosy Jungerstube, or get comfy at Rossalm's sun deck. Bellevue Alm looks back on 600 years of tradition, and boasts typical mountain hut charm. At Stubnerkogel's mid station you can find Ahornhütte and Bergstadl. With seven different facilities, Schlossalm has the resort's broadest culinary offer. Right at the top station you find Kleine Scharte with its large sun deck. Typical Austrial snacks are on offer at Berglift Salettl by the base station. The mid station is home to Aeroplanstadl. Gourmets should try Weitmoser Schlossalm. The Gasteiner Skihauben are a true culinary experience. Gourmet chefs create dishes offered at a different one of the ski huts every day. That way, skiers get to enjoy gourmet meals at a different place each day. A leaflet at the lifts' registers tells you what is on the menu where and when. Demanding skiers should ckeck uot the northern slope of Hohe Scharte. With a length of over 10 kilometres (6.2 miles), and a vertical drop of 1,440 metres (4,724 feet), it is one of the longest runs in the eastern Alps. The most challenging run, however, is the two kilometre Bürgerwald run with a vertical drop of 600 metres (1,969 feet). © Gasteiner Bergbahnen AG A walk over the pendant bridge requires courage and nerve. Feel the adrenaline rush as you walk over the pendant bridge at Stuberkogelbahn's top station restaurant. If you venture onto the swinging construction, you should not be scared of heights, and have strong nerves. Only a see-through mesh wire stands between you and the abyss. Mustering up your courage is worth it though, as a beautiful circuit with unique views of the High Tauern waits on the other side. Another highlight with a great view is Glocknerblick viewing platform. At Stubnerkogelbahn's top station you can also go for a little hike on the rock way for some nice views. Gastein valley is also a great place for toboggan fans. Find swift pleasure at Rodelbahn Aeroplan in Bad Hofgastein. First you take Schlossalmbahn to the mid station, then you walk over to Aeroplanstadl, where the toboggan run starts. Sledding under the moonlight? That's possible at Naturrodelbahn Bellvue in Bad Gastein. You can catch the chair to Bellvue Alm daily until 23:30. Afterwards, your riding down through the snowy winter forest in serpentines. At Skizentrum Angertal, Hirschenhütte is the place to go for après ski friends. Here you'll find party music played by DJs every day. At Schlossalmbahn's base station, skiers meet up for a few drinks at Berglift Salettl. Aeroplanstadl by the mid station is another great spot at Schlossalm. Whiskey lovers should visit Goldberg at Schlossalm. A great place for foodies is down at Bad Gastein's cosy underground vaults at Salzburger Hof. You'll be treated to fondue, raclett, or stone platters. At Ristorante Angelo, guests find a combination of Italian cuisine and regional ingredients. Locan specialities are on the menu at Kaiserhof - Hapimag. They have regular buffet nights as well. From the Salzburg direction you take Tauern motorway until Bischofshofen, exit Gasteinertal. Coming from Innsbruck, take the motorway via Wörgl, and follow B 312 via St. Johann/Tirol until Lofer. Continue on B 311 via Zell am See to Lend, and then on B 167 until Gastein. From the south, you travel via Villach, Möllbrücke, and Obervellach to Mallnitz. From there you reach Gastein over the sluice. Have been to Bad Hofgastein last year in House Gruber. Nice hosts, nic resort. I hope I can return some day. Greetings from Latvia.